Shares in Mobile telecommunication giant, MTN Group, has surged 4 percent barely 24 hours after Central Bank of Nigeria, CBN announced that final decision has been reached on the $8.1 billion MTN Nigeria repatriation. The stock rose yesterday as much as 4.1 percent before trimming gains to trade 2.14 percent higher at 87.6 South African rands. According to traders, the rise is due to the announcement by CBN that the sanctioned placed on the telecommunication firm in August due to ongoing dispute could soon be lifted. “Looks like there’s something that going to be finalised in Nigeria and the share price is reflecting that,” said Ryan Woods of Independent Securities. Another trader hinted that the disputed amount could be reduced by the Nigerian Apex bank. South Africa earmarks $1bn for South Sudan oil sector devt. The South African Government has concluded plans to invest $1 billion in South Sudan’s oil sector, basically to boost the standard within the sector. The funds was announced after they signed a Memorandum of Understanding, MoU which will also involve South Africa participating in the exploration of several oil blocks. Gatkuoth stated that the deal also offers avenues for cooperation in the construction of a pipeline to serve fields located in the south of the country. It would be recalled that South Sudan exports its crude through another pipeline that goes to a port in neighbouring Sudan to the north. According to South Sudan minister, it is instrumental to have a new a pipeline. The former Vice President, Atiku Abubakar, has indicated that Nigeria was going through numerous challenges, such that were threatening unity, economy of the nation, and that most worrisome of all, was in area of security, that seems tougher than monster Nigerian government could handle. Atiku said that until Nigerians collectively accept that difference between Nigerians was not North and South, Christian and Muslim or that of political parties’ preference, the nation would persist yearning for ways out of the challenges plunging the country in crisis on daily basis. To him, Nigeria needs to be restructured and that the nation must embrace restructuring as a tool that must be done to fix Nigeria’s broken systems and not just a campaign gimmick. In his analogy, difference must be between good and bad people and that the country as a whole must demonstrate that good forces were much more than bad ideologies. Raising concern on state of security, Atiku noted that a group of girls were few days abducted from Government Girls Secondary School in Dapchi axis of Yobe State and were yet to be located, just as Chibok schoolgirls too were kidnapped years ago by Boko Haram militants, the abductors of the former. Delivering a key note address at Silverbird ‘Man of Year’ yesterday in Lagos, the former vice president also noted that the challenges facing the country were symptoms and not ailment and that Nigeria was caught in a modern-day Malthusian Trap, with population growing faster than Gross Domestic Product (GDP). He claimed that Nigeria has overtaken India as world’s capital of extreme poverty and that there were more extremely poor people in Nigeria than in the latter, a country that has six times Nigeria’s population. “Our nation is going through a lot of challenges. There are challenges to our unity, economy. Most worrisome are the security challenges we are currently facing. “When people do not have jobs and the means to start a business are beyond their reach, they are incrementally much more likely to engage in criminal behaviours like terrorism, kidnapping, militancy and armed robbery. “Nigeria has a median age of 18.3 years. Our population is young. So when we have successful and laudable initiatives like YouWIN, we must continue them even when there has been a change in administration. Admonishing gathering at the event on solution to the nations problems, Atiku stressed that fighting corruption would not be enough for the country to tackle issues, but moving beyond sentiments and media trials, as well as looking at fact. He added that despite the country fight against corruption in past years, Transparency International scored Nigeria even lower than in 2014, the situation of which signified that the nation need more and advance tactics to combat the vice and that of others. “We talk of fighting corruption, but let us move beyond sentiments and media trials and look at the facts. “We have to kill the snake of corruption that swallows the commonwealth that should lift our people up from poverty. Whether that snake is in a JAMB Office or any other government office, we must kill it or it will kill us”. Atiku reminded that during his tenure as vice president, his government reduced recurrent expenditure by introducing monetization policy and privatizing government enterprises, the system he claimed had been abandoned and recurrent expenditures had ballooned. “We cannot spend 70% of our budget on recurrent expenditure at a time Nigeria has more unemployed or underemployed people than the entire population of the Republic of Cameroon. “We have to enact laws to prevent leaders from diverting public funds from the public health sector to the treatment of the elite in the best hospitals abroad. “If you can afford it from your own private resources, then pay for it. But do not make the tax payer pay for it. “Our elite are treated in Europe. BBNaija is being broadcast from South Africa and Nike is unveiling our FIFA World Cup Jersey in London. Is this the extent to which we have outsourced Nigeria?, he raised concerns. A former agent for French arms conglomerate Thales and its South African subsidiaries, Lawyer Ajay Sooklal on Monday testified at the People’s Tribunal on Economic Crime at Constitutional Hill in Johannesburg. Before his exit from the proceedings, Sooklal, among other claims, stated that Thales committed to a R500 000 a year “payment” to then deputy president Jacob Zuma to secure the deputy president’s protection in any South African probes into Thales’ conduct in the arms deal while the alleged payments were also intended to secure Zuma’s support of the company’s future dealings with the South African government. He also claimed that Zuma received payments and other benefits, including air tickets and tickets to the 2007 Rugby World Cup in France, from Thales, between 2005 and 2009. Sooklal, however, did not confirm whether the R500 000 a year payment materialised. “Shamin “Chippy” Shaik, the brother of Schabir Shaik and the former head of South Africa’s arms procurement process, received a cash payment of US$1m from Thales. Zuma invited Sooklal to a meeting at the president’s official residence in Pretoria in August 2012. Zuma allegedly told Sooklal that he had just appointed the Seriti commission of inquiry into the arms deal. He then allegedly implored Sooklal to refrain from testifying about Zuma’s payments from Thales or Thint at the commission of inquiry. “The very top executives of Thales, which was earlier known as Thompson-CSF, and its South African subsidiaries, were all directly aware of or actively sanctioned the dubious payments made around the arms deal contract. Two successive French presidents directly placed pressure on former president Thabo Mbeki and later on Zuma to ensure that any South African probes into the arms deal would not focus on Thales. In 2004, former president Jacques Chirac allegedly tried to influence Mbeki and other senior government officials to help ensure that Thales wouldn’t come under the magnifying glass in arms deal investigations in South Africa. In 2008, after Zuma had become ANC president, Chirac’s successor, Nicolas Sarkozy, allegedly met with Zuma in Paris. Sarkozy allegedly asked Zuma to help make the investigations into Thint, Thales’ South African subsidiary, “disappear”, Sooklal further testified. South Africa’s ruling African National Congress (ANC) is set to hold an emergency meeting on Monday to discuss President Jacob Zuma’s future as head of state. The meeting was called after overnight talks with the scandal-plagued 75-year-old failed to secure his departure. Zuma, in power since 2009, has faced growing pressure to resign since he was replaced as leader of the ANC in December by Cyril Ramaphosa, the deputy president. The ANC has summoned its National Working Committee (NWC) to meet at 1200 GMT at the party’s Luthuli House headquarters in downtown Johannesburg. In order for the party to force Zuma to resign as state president, the NWC would have to call a meeting of the National Executive Committee, its top decision-making body, to vote on Zuma’s exit. The ANC’s top six most powerful officials met Zuma late on Sunday at his official residence in Pretoria but there was no announcement of the outcome. In a sign of Zuma digging in, a group of supporters called Black First Land First said they would march to Luthuli House on Monday. In response, a pro-Ramaphosa faction of the ANC said it would “defend” the building, raising the prospect of clashes between different camps of the ANC. Zuma has been deserted by prominent allies since Ramaphosa became leader of the only party to govern South Africa since the end of white minority rule in 1994. Ramaphosa, 65, is in a strong position to become the next president and has been lobbying for Zuma’s removal. Zuma has not said whether he will step down voluntarily before his second term as president ends next year. Opposition parties and some in the ANC want him to go before his State of the Nation address to parliament, scheduled for Thursday. Ahead of Nigeria’s participation at the forthcoming African Nations Championship, CHAN, former England striker, John Fashanu, has tagged the group match between Libya and Nigeria as a battle against slavery. Libya, which has been plunged into political instability since the overthrow of the regime of dictator, Muammar Gaddafi, in 2011, will play Nigeria in the Group C fixture which comes up in Tangier, Morocco, on January 23. Recently, the country has been involved in the enslavement of African migrants seeking to reach Europe through the Mediterranean sea. The match against the home-based Eagles will have a political dimension as Nigerians were among the Black Africans enslaved in the country. Nigerians in batches have continued to be repatriated from the unstable country following the intervention of the federal government. Fashanu, slammed Libya, saying the country should be rated a terrorist country for violating the dignity of Black Africans who reside in the same continent as the North Africans. “Nigeria match against Libya will be a bombshell. I hope we get to do well and in fact win the match against Libya,” Fashanu said. The former Wimbledon player further suggested that the high profile encounter should be used as platform for a campaign against slavery and to expose the horrible and ridiculous things going on in the country at the moment. The coach Salisu Yusuf led-team will seek to go farther than the third-place finish in their maiden appearance in the competition hosted by South Africa in 2014. For those who missed the talk-of-the-town wedding between R & B singer and actor, Bankole Wellington, a.k.a Banky W and Actress, Adesua Etomi, the celebrity ‘turn-up’ is set to hit the Africa Magic channel tomorrow. According to the official trailer by Africa Magic, the couple shared details on why they chose to share their special day with the world, while stating that the wedding will be shown in the guise of a documentary titled “The Wellingtons”. Africa Magic is a collection of Pay TV entertainment channels which focuses on programming of Africa-related culture and heritage. 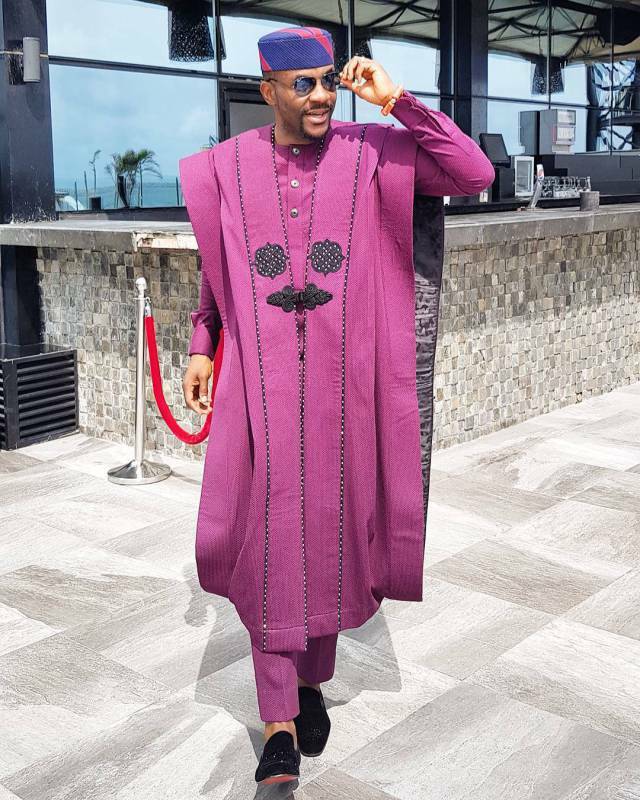 It would be recalled that the marriage between the two celebs caused a lot of stir on the internet with hashtag #BAAD2017, with TV Personality, Ebuka Obi-Uchendu who stole the show with his bedazzled Agbada outfit at the traditional wedding. The two celebrities who starred in the Nollywood romantic movie, ‘The Wedding Party 1’, playing the principal roles of Dunni (Adesua) and Dozie (Banky W) in the award-winning romantic comedy produced by Mo Abudu. Adesua who became the third most searched individual on Google Nigeria during the year, attended City College Coventry (Dip) and University of Wolverhampton while starring in her first feature film, “Knocking On Heaven’s Door” in 2014. She has since appeared in Shuga, 10 Days in Sun City, Ayamma, The Arbitration, Out of Luck, Falling, A Soldier’s Story, Gidi Up, amongst others. She also won the Best Actress in a Drama award at the 2016 Africa Magic Viewers Choice Awards for her role in the 2015 romantic drama `Falling’. Banky W and Adesua at their traditional wedding. Banky W, who debuted his acting career with The Wedding Party (2017) founded a record label, Empire Mates Entertainment. Empire Mates Entertainment (stylized as E.M.E) in 2002. The label is home to recording artists such as Wellington himself, Shaydee and Niyola. Nigeria’s Under 20 women’s team have kicked-off preparations ahead of their all important final FIFA Under 20 Women’s World Cup qualifying round clash with South Africa. The Falconets camp opened on December 18, and held their first full training session with a full squad on December 20 afternoon at the FIFA Goal Project, Abuja. The trio of Charity Rueben, Rasheedat Ajibade, and captain of the team, Kemi Famuditi, were part of the training session as they gear up for a double-legged encounter with the Basetsana. This latest development sees the Christopher Danjuma tutored side spending their Christmas at their base to continue their training until January. The Falconets, earlier in November, had advanced, having defeated Morocco 6-2 on aggregate after pummeling the North Africans, recording a 5-1 victory at the Samuel Ogbemudia Stadium. While the South African side progressed after they secured a first leg 2-0 deficit, and a 5-0 second leg victory over Burundi at the Dobsonville Stadium, South Africa. Danjuma and his wards will be hoping to maintain Nigeria’s winning streak against the Southern Africans when both sides meet for the sixth time at this stage. Nigeria will travel to Johannesburg for the first leg clash at the Dobsonville Stadium before the return leg at the Samuel Ogbemudia stadium, Benin City, two weeks later. Winner of the double-header will qualify as one of Africa’s representatives at the FIFA Under 20 Women’s World Cup in France between August 5 and 24, 2018. The Super Eagles again dropped in the latest FIFA ranking released Thursday, December 21, as they now occupy the 51st position in the world and 9th in Africa; the worst yet. The previous ranking saw the Gernot Rohr-led side drop to 50th place and it does not seem to be getting any better, as the team continues to drift. The Eagles who were very impressive throughout world cup qualifiers are now the 6th lowest ranked team going to the world cup. Meanwhile world champions, Germany, retained the first position, followed by Brazil, Portugal, Argentina and Belgium to make up the five best teams in the world, as it remained unchanged from what it was last month. The release also saw Algeria move up six places and back into the top 10 teams in Africa displacing Ivory Coast. The top ten teams in Africa include: Senegal, Tunisia, Egypt, Congo DR, Morrocco, Burkina Faso, Cameroon, Ghana, Nigeria, and Algeria. The top ten countries in the world include: Germany, Brazil, Portugal, Argentina, Belgium, Spain, Poland, Switzerland, France, and Chile. In the mean time, Nigeria’s 2019 African Cup of Nations qualifying opponents- South Africa, Libya and Seychelles sit in the 81st, 88th and 192nd places respectively in the updated ranking. Also, Nigeria’s World Cup rivals Croatia and Iceland occupy 17th and 22nd spots respectively on the ladder, as Argentina was earlier named the fourth placed team in the world. As the build-up for the next Commonwealth Games begins,The City of Birmingham, United Kingdom, is expected to be announced as the host city for the 2022 Games, on Wednesday, December 20. Media reports suggest that the decision could be formally announced at a news conference attended by Commonwealth Games Federation, CGF, President, Louise Martin, in Birmingham on Thursday, December 21. The Midlands city was the only potential host to submit a bid before the September 30 deadline, but the CGF ruled that the bid was not “fully compliant” and re-opened the bidding process for a further two months. No further bids were received before the November 30 final deadline. Durban, South Africa was originally awarded the Games in 2015 before being stripped of the event in March because it failed to meet promises contained in its bid. Birmingham was chosen as Britain’s candidate city in September, beating a rival bid from Liverpool and receiving UK government’s backing. Bid organizers have said that 95 percent of the competition venues are already in place with Alexander Stadium, an established athletics venue, set for an increase in capacity and facilities upgrade. The only new venue proposed in Birmingham’s bid, is the Sandwell Aquatics Centre, which will host Swimming, Para Swimming and Diving. The city center Victoria Square will also be used for 3×3 Basketball and Wheelchair Basketball.